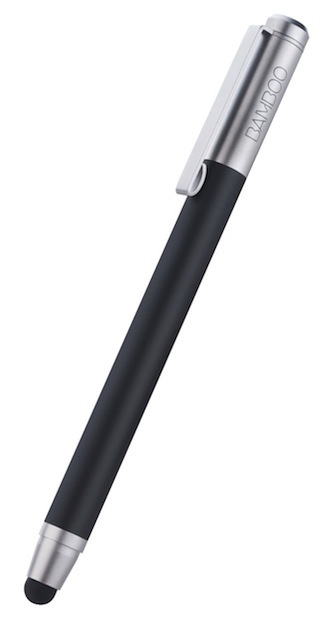 Over the weekend I picked up my first stylus for my iPad, the Wacom Bamboo. I went with this one because 1) Wacom has been making styluses for their own tablets for a long time, so I figured they must be good at it and 2) it received high marks from Serenity at Macworld. I’ve had my iPad (the original) since August of 2010 and put off buying a stylus until now because every time I looked at them I heard Steve’s voice in the back of my mind saying, “If you see a stylus, they blew it.” So why did I give in after 1.5 years? Simple: despite years of experience in pre-school, it’s pretty hard to draw with my finger, and I have some diagrams and sketches I want to include in my course notes. I am no artist, but even I can cobble together an acceptable diagram given enough time and ready access to an ‘Undo’ button. Now that I’ve used it for a couple days, I can say a couple things about it. First, there is a sense that my old, fat, heavy iPad is a brand new thing. I’ve always been struck by how the iPad dissolves into the background when using a well-designed app. It’s been said far more eloquently before, but part of the “magic” of the iPad is how it completely becomes whatever app is currently running. What does this have to do with a stylus? Well it happens that you begin to discover a whole new assortment of apps that you never paid attention to before, or if you did it was only for a few minutes as a novelty. I’m talking about things like SketchBook Pro, Notability, and Penultimate, to name a few. The other thing I know for sure is that a stylus is totally goofy for doing any kind of navigation in iOS. Even in a drawing app, I find it unnatural to use it to select different colors, pens or brushes, so I tuck it into my hand and use my finger instead. These various tap targets still feel best when selected with my finger. I can imagine it must be tempting for app designers to optimize their targets for a stylus, given that the majority of people who are using drawing apps are probably using one, but I hope it never happens. I have the stylus because it allows me more precise control for drawing, period. In that sense, the most important sense, Steve was right. And at the same time, adding a stylus to my iPad makes it even more capable.